This is the Audi Sport Quattro Concept, a modern day interpretation of the marque's 80s Sport Quattro coupe, which is due to be unveiled at next week's Frankfurt motor show. Audi previously released a Quattro Concept back in 2010 with the intention of producing a limited run of cars for wealthy customers. However, the project was shelved in 2012. This time, however Audi plans for the Quattro Concept to become a performance halo model for the brand and spiritual successor to the original Quattro, which will sit above its R8 supercar at the very top of the model line-up. The car uses a petrol-electric hybrid drivetrain, utilising the 4.0-litre V8 engine currently seen in the Audi S6 and Bentley Continental GT. It develops an astonishing 690bhp – enough to make it the most powerful Audi road car ever. Such power enables the Sport Quattro Concept to hit 62mph from a standstill in 3.7 seconds and reach a top speed of 189mph. Incredibly, thanks to the part electric system, Audi claims the car will return 113mpg and emit just 59g/km of CO2, aided in part by cylinder deactivation technology, which can shut down four of the engine's eight cylinders when cruising. The Quattro Concept can also travel up to 31 miles on electric power alone. Unsurprisingly, the Concept is fitted with Audi's signature Quattro four-wheel-drive system, with power being channeled through an eight-speed automatic gearbox. Three separate driving modes will be offered: EV, Hybrid and Sport. EV restricts the car to electric power only, where Hybrid optimises both the petrol and electric motors for increased economy. And – you've guessed it – Sport mode switches everything to maximum attack for full performance. To offset some of the weight of its complex mechanicals, the Quattro Sport Concept is built largely out of high-strength aluminium with some panels, including the bonnet and boot lid being fashioned from carbon fibre. 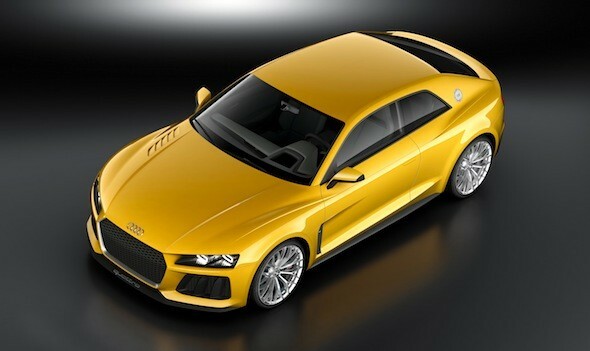 Currently, there is no word on when a production Sport Quattro will arrive or how much it will cost. However, we're sure you'll agree that it can't come soon enough.